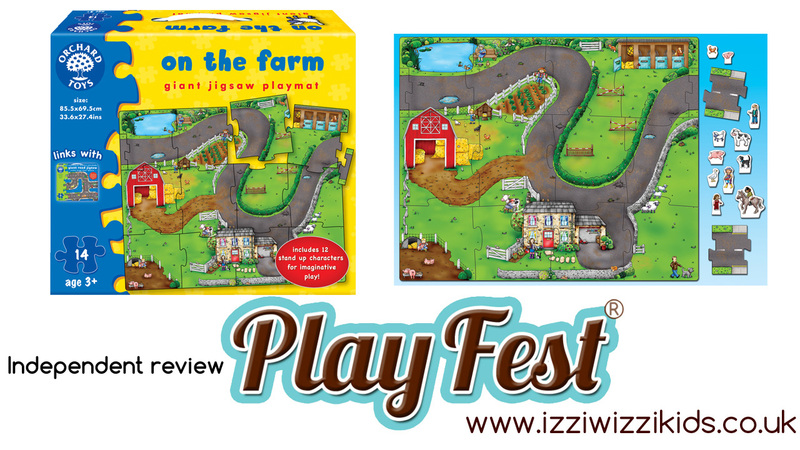 We have been lucky enough to review the On the Farm - Giant Jigsaw Playmat by Orchard Toys for Izziwizzi Kids Playfest. As with all Orchard Toys games and puzzles this is designed and manufactured in the UK from strong 100% recycled board. It has really bright colours, modern pictures and chunky pieces that don't bend or come apart during even quite boisterous play. Orchard Toys are built to be played with, and built to last. On The Farm retails at £13.95. It is suitable for 1 or more children and the suggested age range is 3-12. It promotes imaginative small worlds play and helps with manual dexterity, comprehension and understanding of the world. It develops language skills and encourages conversation. It is two-fold in that it is a jigsaw and then a playmat using the characters supplied and any other animals, people and vehicles which the child may have available to them. Although this works perfectly as a stand alone item, it can be combined with the Giant Road Jigsaw using the included link pieces, to create a far bigger playmat which can be put together in a multitude of different ways to create a landscape suitable for the play area, number of children taking part or just whatever your child wishes. When they were young my older boys had a 'road' which was comprised of jigsaw pieces in a similar way, but was nothing like as durable or attractive as this one. They loved it and played with it regularly for months until it fell apart. The board that Orchard Toys use is really thick and will last far longer, it also stays together really well even when being 'driven' across with toy cars, ponies, aliens or anything else! In my experience adding a playmat to pretend play makes it a completely different game. The pictures encourage the children to 'group' like items, consider what happens in real life far more and give visual cues as to how their play can progress. They are more likely to 'feed' their animals and keep their main storyline going for longer rather than shooting off at tangents constantly. It gives a focus for play and keeps the active area contained! 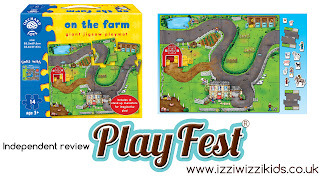 We're so impressed with the Giant Jigsaw Playmat that when we saw the Giant Road Jigsaw for sale at the RRP of £13.95 while on holiday in Wigtown this week, we bought it. On The Farm gets a definite 'thumbs up' from all of us. Ah, love it! Horses don't eat carrots! So sweet. This looks huge - Z loves jigsaws at the moment so this may be perfect for him. Plus, it looks like you can't actually lose the pieces! What a brilliant review, thanks so much to you all. Really pleased to see that your two young lads had fun assembling and playing with our Giant Farm Playmat. Would love to see a review of this Playmat joined up to our Giant Road Jigsaw. Hope your floor space is big enough for them both as, together, they do take up quite a lot of room! !